-- Select a Size/Color -- Small Bone - Out of Stock! Show your love for your pet and bring them home with a Bone Small Engravable Pet I.D. Tag in Gold and Bronze Glitter! Add a designer upscale look to your dog with the Bone Small Engravable Pet I.D. Tag in Gold with Bronze Glitter epoxy. This classy dog I.D. tag will ship to your door, ready to use. Don't let your pet leave your house without I.D. so they know how to get back. This small I.D. tag provides a lighter and less obtrusive look for smaller dog breeds and puppies. The warm tones look great with a wide range of coat colors. Include your pet's name, your phone number, address, etc., with this eye-catching pet I.D. tag. Our pet tag designer will create a look that's legible and stylish. 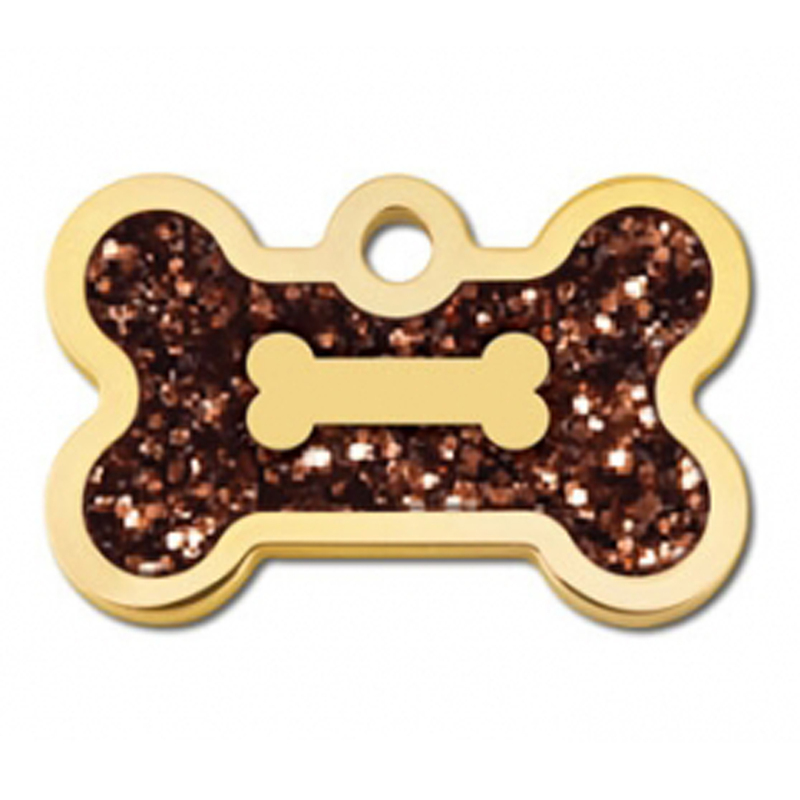 The shiny brass paired with bronze glitter looks great with many of our stylish collars. This I.D. tag will be carefully customized and hand polished for your pet. Your tag will arrive with a jump ring connector to apply to your pup's collar. Brass plated and epoxy filled. Look for other charms or our Small Bone-Shaped Pet Tag Silencer to protect your pet's tag. Posted On 06/06/17 by Diana R from Katy, TX Yes, Diana R recommends this product! Received the dog tag and love it, well made small is perfect for Jazz she is a chi, very classy looking. Posted On 05/07/17 by Michelle s from , MI Yes, Michelle s recommends this product! Charm was very nice however it came in black and gold vs gold and bronze, sent a email to customer service, replacement sent. Otherwise happy with purchase. Posted On 02/03/17 by lynn j from burbank, IL Yes, lynn j recommends this product! It was so cute by letters were the same as the tag so you can't see the name but . Posted On 01/05/17 by Logan T from , NC Yes, Logan T recommends this product! The tag was beautiful! Just like the picture! Engraving was also beautifully done! Posted On 12/13/16 by michelle d from , FL Yes, michelle d recommends this product! Very good quality. I ordered the small one which is perfect for a cat or very small dog. If you have a bigger dog make sure you order a larger size. Definitely would recommend. Posted On 08/21/16 by SHAUNA W from Temple, GA Yes, SHAUNA W recommends this product! I love little Snowball's ID tag! It looks like such high quality and the price was so reasonable! I will definitely be using BaxterBoo as my furbaby's new store! 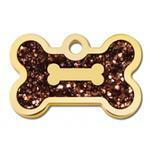 Pet id tag, gold and bronze glitter. Posted On 08/16/16 by Kathy M from Garland, TX Yes, Kathy M recommends this product! Beautiful, unusual love everything about it! Posted On 08/03/16 by Jody S from SPOKANE, WA Yes, Jody S recommends this product! Exceptional engraving, with the depth of lettering which won't wear off! Our other dog tag (from another source), is ALMOST illegible after only 3 months. We will replace it with this new tag.